Find a metal stamping company who is a good fit for your product and eager to become a strategic partner in your success. Selecting the right metal stamping company to work with is a tough decision. You want to choose a manufacturer with the ability to offer top quality, service and price—which seems simple enough, right? However, successfully identifying the best vendor for your needs actually requires a thorough review of several characteristics critical to the immediate and ongoing success of your product. HPL Stampings encourages you to download our free eBook, Qualities of a Good Metal Stamper, to learn how to evaluate potential metal stamping vendors and identify the right company for your product. 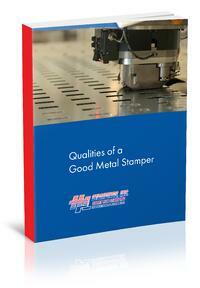 Simply complete the form on the right to receive your free copy of our eBook, Qualities of a Good Metal Stamper.